For all the recent talk surrounding Star Trek 3, there’s still no official word on who will direct the first post-J.J. Abrams installment in the rebooted franchise. Most of us expect it to be Roberto Orci. The writer and producer of the earlier films has long been linked to the job, and is obviously working on the film in some capacity, even though this would mark his first time in the director’s chair, in any director’s chair. One star, John Cho, shares this stance, and not only expects Orci to helm the picture, but also to do a bang up job. 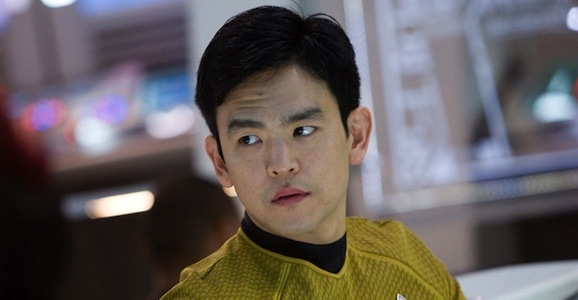 Cho, as you’re probably well aware, plays Hikaru Sulu in the new films, taking over the role from his predecessor George Takei. The actor, who co-stars the new ABC sitcom Selfie with Doctor Who alum (and Guardians of the Galaxy star) Karen Gillan, did an AMA session on Reddit recently, and the subject of Orci came up. I’m absolutely confident in Bob. No one knows these characters better than Bob. And no one knows the Star Trek universe better than Bob. I think he’s going to blow people away. And I don’t know anything about Star Trek 3…. I’m guessing I’m in it? I just went in for a costume fitting. If they’re fitting people for costumes, you have to assume that production is moving forward. We’ve heard that filming could begin as early as February 15, 2015, and we know the script is finished, and that there’s a spot for William Shatner to reprise his Kirk role if he’s interested. Not much is public regarding the story, aside from vague reports that we finally, after two movies that largely go down on Earth, pick up in the middle of the Enterprise’s traditional five-year mission to explore the galaxy. We like our space-based sci-fi to actually take place in space, especially when the name Star Trek is involved. We don’t have an exact timeline for Star Trek 3 yet, if fact, it hasn’t even been officially given the go ahead (they’re still reportedly hashing out budget issues). But it does look like things are moving forward, and Paramount has their eye on a summer 2016 release date to coincide with Star Trek’s 50th anniversary.